Artigiano is located near SE 34th and Division in Portland, Oregon. Finally, after a couple years on my bucket list, I finally was in the area to try their food. 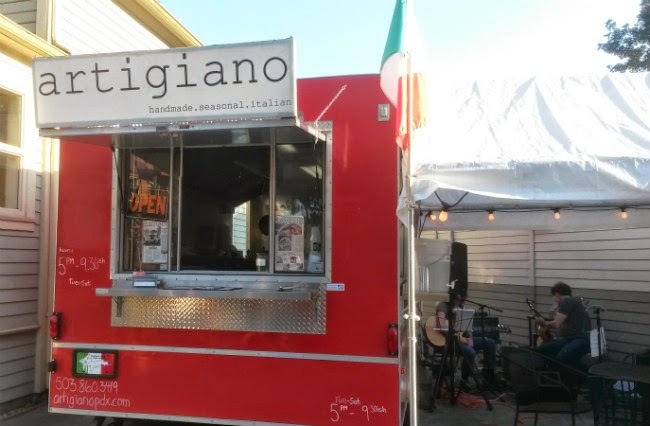 Artigiano is a stand-alone cart, not in a food pod, and they may have live entertainment inside the adjacent tent. Everything here -- especially the pasta -- is made fresh. I went with the Tagliatelle with Pesto and Potatoes ($13). Being a big pesto fan, I was quite stoked. Execution was great on everything. The only thing for me: the portion size won't fill me up. I'd likely need at least three helpings of this. Normally, $13 at a food cart gets me enough food for a fluffy panda coma. The "Dinner for Two" and "Family-Style Feast" options here seem more the way to go. It'll be roughly $20 per person for 3-4 courses. The "Dinner for Two" option changes nightly.